WordPress plugins arena is supersaturated, but at the same time, new entries always make their way which is quite promising and overwhelming at the same time. It takes sheer amount of persistence, strategic planning, and hours of hard work to get in and thrive. And the plugins which stay in WordPress economy definitely worth the effort. One of such plugins is WP Rocket, launched in 2013 in the presence of big names and stayed since then. 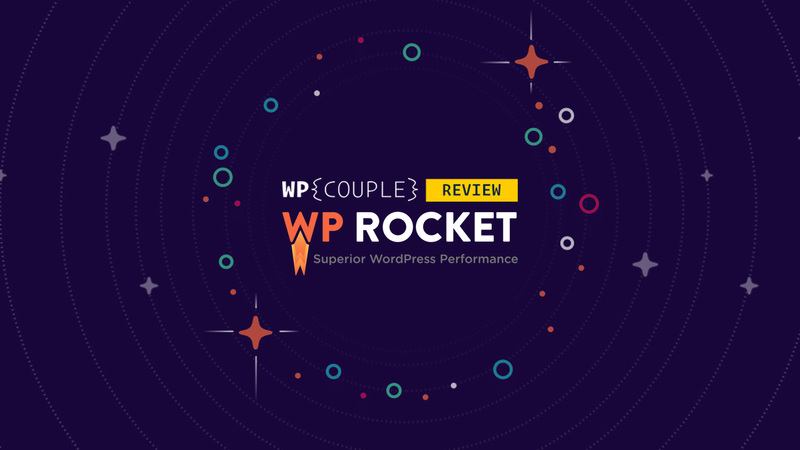 WPCouple reviewed WP Rocket over a year before, and since then it has gone through substantial growth and changes. I have been using it throughout this period, and it’s quite exciting to see how it has shaped up. Today, I am going to review the changes WP Rocket has gone through during this period. I will be taking a look at the new features, incredible new achievements, and does it worth your money even today or not? So, let’s get started! 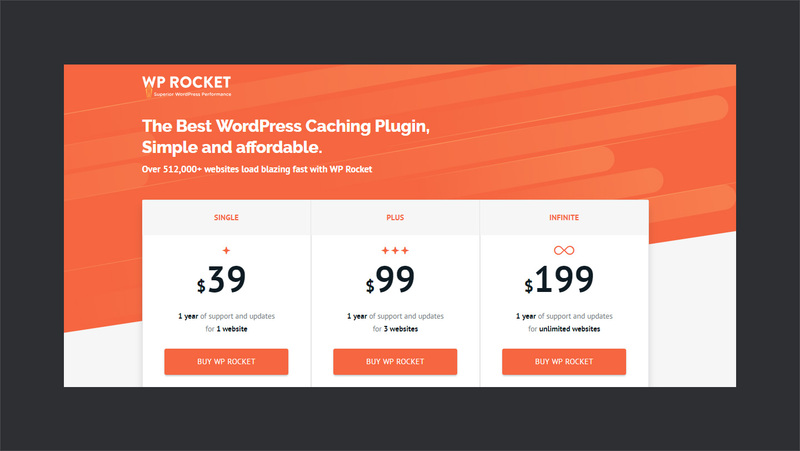 WP Rocket is a five years old high-end premium WordPress caching plugin which helps you optimize your site with minimal efforts. As mentioned earlier, it was launched back in late 2013, and since then it has gone through exponential growth to reach this point. Currently, it serves 512,000+customers and rocks a 92% satisfaction rate based on 2,311 ratings from 28% of their userbase. 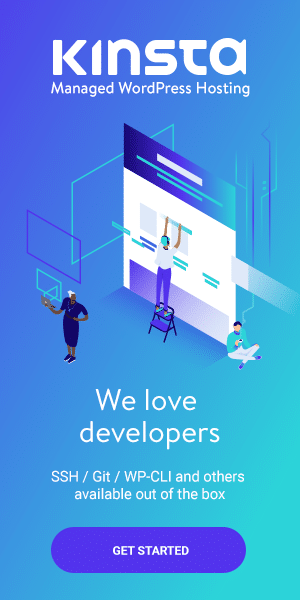 🎖️ The incredible developers behind WP Rocket — Jonathan Buttigieg, Jean-Baptiste Marchand-Arvier, Julio Potier — and the whole team deserves the credit for this success. 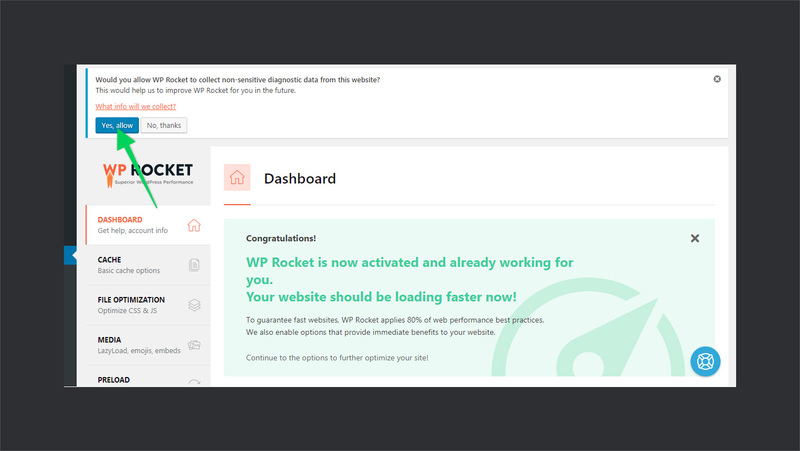 Minimal Configuration, great Support, Database Optimization, Cache Preloading, Browser Caching, CDN Support, Lazy Loading, and eCommerce Support has always been key features of WP Rocket. But during the last year, it has grown strategically, and the team worked exhaustively to enhance the UI and UX. 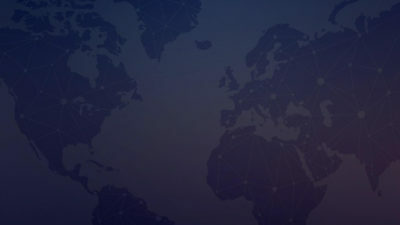 It helped in userbase growth and consolidated its position in the market. When it comes to performance WP Rocket beats virtually all of the competition. One of the major change is the UI and UX change in this year. Smart minds at WP Rocket worked closely with the support team to identify the grey areas and figure them out. They worked for months on the feedback to research out a better UX along with a great UI. Also, they conducted a series of interviews to shape the new user experience. The very first thing to notice is, the color scheme which is similar to their website and they’ve done a great job in keeping it consistent. It probably makes use of AJAX to provide a fast and responsive dashboard. You don’t have to refresh the page to switch between different tabs, make the changes and hit Save Changes button — you’re all set. 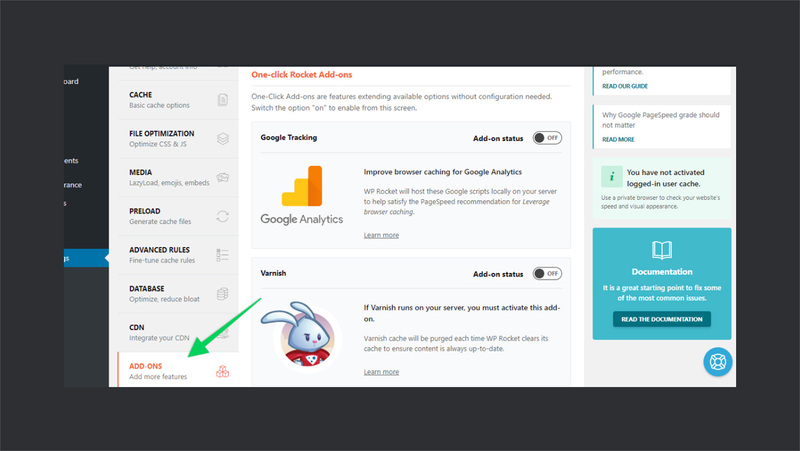 Another thing worth mentioning about their new dashboard is that it shows useful tips and links on the right side.  They link to the detailed blog posts by WP Rocket which helps you understand the settings and set up the best practices. Also, it links to the documentation page to quickly navigate you through your queries. We at WPCouple love Kinsta — coz why not? 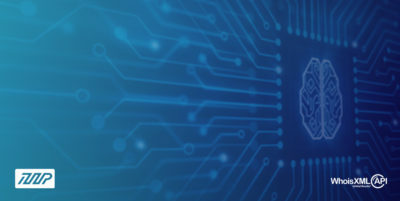 They provide a high end Managed WordPress hosting service powered by Google Cloud. On the top, they rock incredible support team and a super awesome dashboard.  We even wrote a detailed review on why we love Kinsta as Managed WordPress hosting and why it’s dashboard is one of the best you can ever wish for. On the other hand, WP Rocket is the leading cache and performance plugin. One of the main highlights of the past year is Kinsta & WP Rocket partnership. 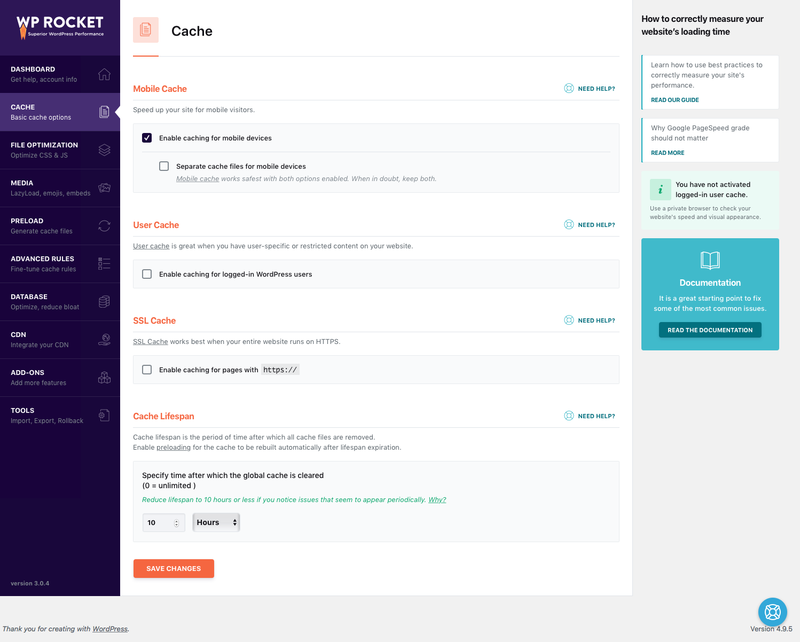 Kinsta doesn’t usually allow any cache plugin cause they conflict with some of their built-in solutions. But the team at WP Rocket worked with Kinsta to make it compatible. With these two combined you make your sites load crazy fast. 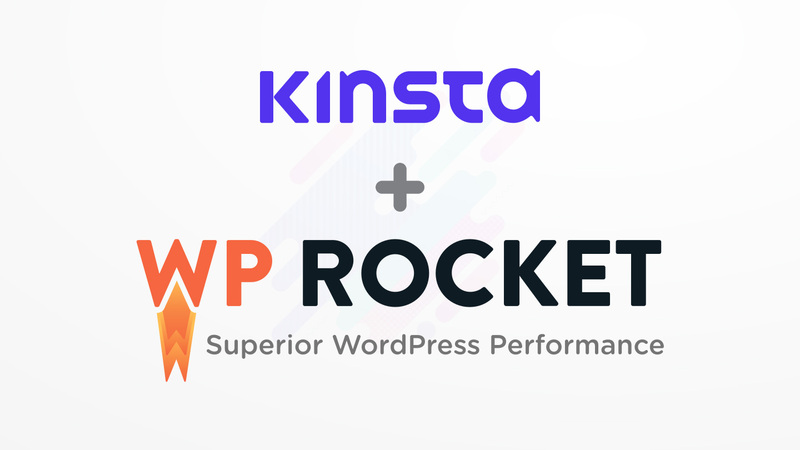 You can take advantage of both the built-in cache of Kinsta and the performance features of WP Rocket to optimize your site. You can read more about it here. 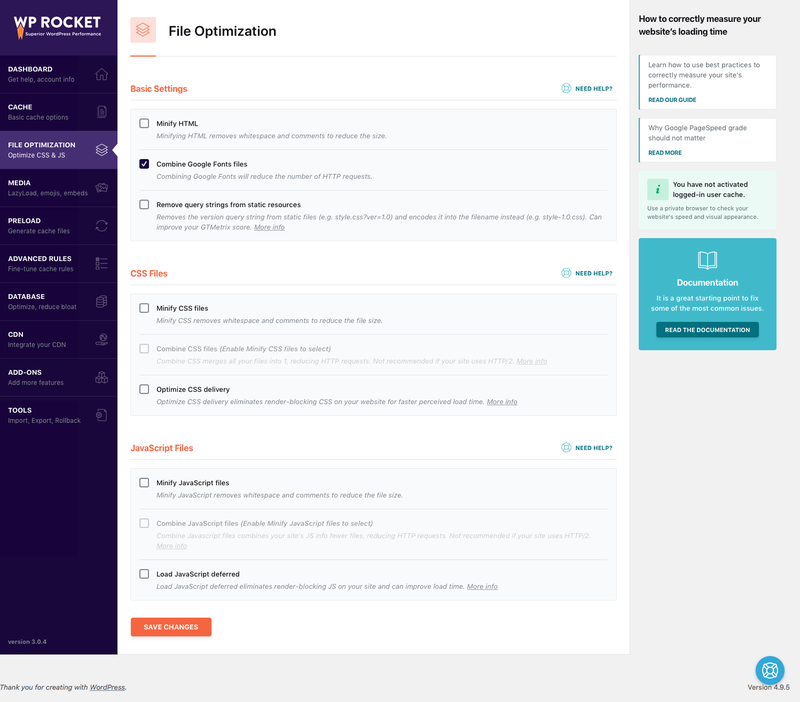 So, if you’re a Kinsta customer, you can happily try out WP Rocket. I always prefer to rely on the documentation instead of writing emails to the support team. It saves me a lot of time, and I can get stuff done quickly. From the beginning, I used the WP Rocket documentation to get to know stuff whenever needed. But after the major overhaul of the dashboard, docs became obsolete. So, the team at WP Rocket wrote all the documentation from scratch. You can find up-to-date documentation on their docs page. Every bit of it has been updated, and they’ve extensively documented every aspect of the plugin. Just in case if you have not checked the documentation of WP Rocket, you should definitely check it out. It’s covered in detailed and is pretty awesome. They contain around 300 articles which cover different sections step by step with screenshots. There’s even a section for developers to help them extend the plugin easily. Check out the GIF below for the documentation section and a sample article. Another interesting change which WP Rocket team has brought in the plugin is data collection. Now, they collect user data to plan the next update and make critical decisions. But they explicitly ask you for data collection when you install the plugin. In case you’re wondering, it doesn’t collect or misuse any personal data. It takes information like server type, WordPress version, current language, theme, and which features of the plugin you’re using. So, yeah, it’s GDPR compliant, data is collected anonymously, and requires your permission — no worries! There’s nothing new to the pricing, but there’s this fact that WP Rocket is still priced the way it was a year before — dope! The single pack starts at $39 for 1 site for 1 year of support & updates, and it goes up to $199 for unlimited sites with 1 year of support & updates. 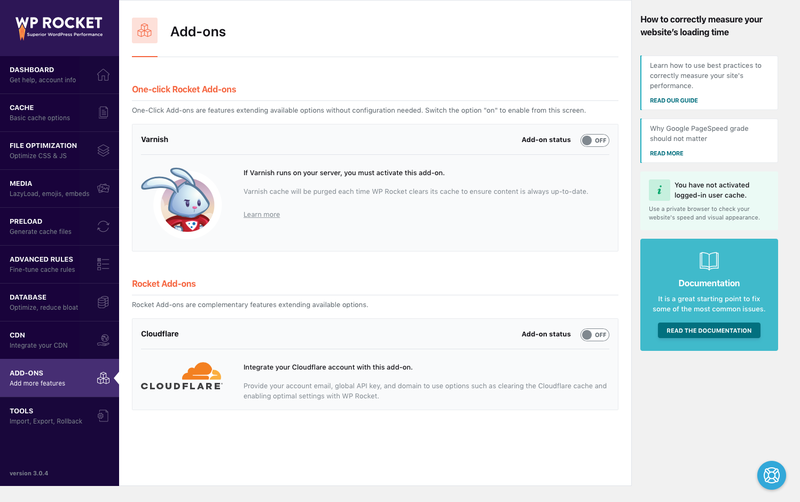 So, you can enjoy the newly revamped WP Rocket plugin with all the new features and performance features for the same price it was a year before. Isn’t cool? WP Rocket is definitely a competitive and reliable cache plugin which has grown tremendously during the past five years. In particular, during the last year, it went through an extensive UI/UX revamp and strategic growth. One of the key highlights is the fact that they maintained their standards while keeping the pricing the same. ⚡️ If you’re a performance nerd or did performance test you might have often encountered leverage browser cache issue. WP Rocket is going to address this issue with a one-click add-on in the future updates. I’m super excited about that! Which cache solution do you use? Have you ever tried WP Rocket? Let’s know about your experience and thoughts in the comments section below.